The aim of this study was to evaluate the additive value of 99mtechnetium methylene diphosphonate (99mTc-MDP) hybrid single-photon emission computed tomography/computed tomography (SPECT-CT) in the diagnosis of skull base osteomyelitis (SBO) compared to planar bone scintigraphy (PBS). This was a single institution; prospective study included 23 patients with otitis externa, clinically suspected of SBO, all of them were diabetic. Three-phase bone scintigraphy and SPECT/CT were performed to all patients. The imaging modalities which had the most equivocal results were PBS (9/23) followed by SPECT (3/23). No equivocal results were detected with CT or SPECT-CT. SPECT-CT had the highest sensitivity (100%) and highest accuracy (95.7%) in diagnosis of SBO, whereas, PBS showed the lowest sensitivity (50%) and lowest accuracy (52.2%). In this study, SPECT-CT considered the best modality for accurate localization of the site of SBO involvement, followed by CT. SPECT and planar BS were less accurate in this consideration. When comparing the sensitivity of planar BS, CT, SPECT and SPECT/CT, statistical significance difference was detected between planar BS and SPECT (P = 0.057), planar BS and SPECT/CT (P = 0.001), and between CT and SPECT/CT (P = 0.031). No statistically significant difference was detected between SPECT and SPECT/CT (P = 0.250), CT and planar BS (P = 0.125), and between CT and SPECT (P = 0.508) In conclusion, 99Tc-MDP SPECT/CT has high sensitivity in the diagnosis of SBO and also provide accurate localization of the site of SBO. The most common symptom of this condition is unremitting deep otalgia that becomes more worse at night and persists in spite of multiple courses of antibiotic therapy. A granulomatous polyp is sometimes present in the floor of the external auditory canal, and it is pathognomonic of this condition. The diagnosis of SBO is based on the clinical findings and confirmed by laboratory tests and imaging studies. Laboratory tests include erythrocyte sedimentation rate, white and red blood cell counts, glucose level, and microbial culture of ear secretions. Histopathological examination of granulation tissue from the external auditory canal helps to exclude malignancy. Anatomical imaging modalities, such as computed tomography (CT) or magnetic resonance imaging (MRI), are used for evaluation of SBO, but they have several limitations.,, CT may be negative early in the disease and can remain positive even after cure. MRI provides excellent soft-tissue contrast but is inferior to CT for evaluation of bone. 67Ga citrate scintigraphy is used in the evaluation of SBO and also for monitoring response to therapy; however, it has poor anatomical resolution. 99mTechnetium methylene diphosphonate (99mTc-MDP) bone scintigraphy may be positive before radiological changes, and so, it is useful for early detection of the disease because of its localization to areas of increased osteoblastic activity, however, its specificity is low, and it has limited anatomical resolution. Three-phase bone scintigraphy (TPBS) and single-photon emission CT (SPECT) may better differentiate between uptake in soft-tissues and skull bony structures. Clinical assessment alone cannot differentiate SBO from severe otitis externa without extension to the adjacent bone structure. Recently, hybrid SPECT/CT can provide precise anatomical localization which is needed to decide the duration of the treatment., Treatment of malignant otitis externa and SBO is a long process. Meticulous aural toilet, antibiotics, and strict glucose control in patients with diabetes, are absolutely vital for success., The aim of this study was to evaluate the additive value of 99mTc-MDP hybrid SPECT-CT in the diagnosis of SBO compared to planar bone scintigraphy (PBS). This prospective study included 23 patients with otitis externa, clinically suspected of SBO, they were referred to Nuclear Medicine Unit (NEMROCK), Cairo University for bone scintigraphy between April 2016 and December 2017. All of them were diabetic (type II diabetes mellitus), and six patients were on insulin. 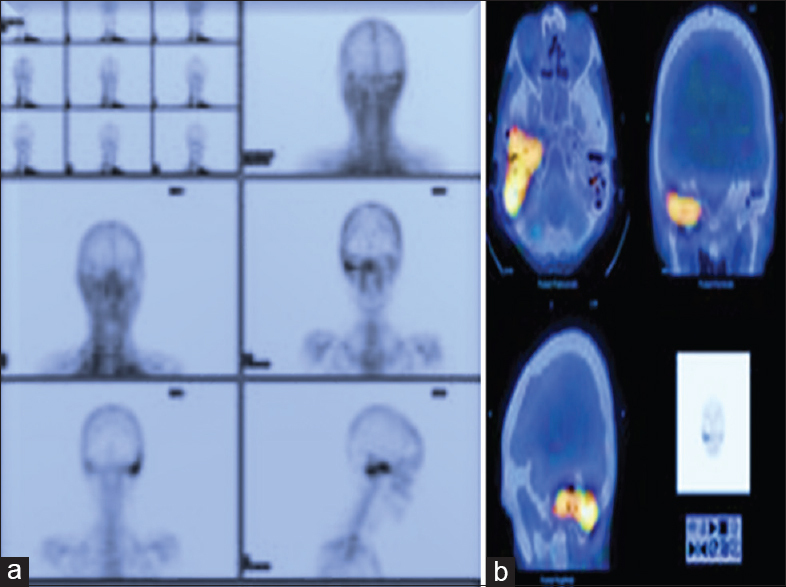 TPBS with SPECT/CT imaging after the delayed phase (post 2–3 h) were performed to all patients. None of the patients had any underlying malignancy either primary or metastatic that could be confused with SBO. Patients were treated with systemic antibiotics, topical antibiotic application, and surgical local debridement of granulation tissue (when present). The use and the duration of antibiotics treatment were depending on the findings of bone scintigraphy, microbiological cultures of ear swabs, and histopathological tests. The patients were intravenously injected with 666–814 MBq (18–22 mCi) 99mTc MDP according to patient's weight. Images were acquired on a dual head gamma camera (Siemens). Parallel-hole, low-energy, and high-resolution collimators were used with 140-keV photopeak and a 20% symmetrical window. Flow (64 × 64 matrix, 40 frames; 3 s each) were acquired immediately after injection. Blood pool and delayed static images were acquired in anterior, posterior, right and left lateral projections of the skull after 5 min and 2–3 h, respectively. Delayed anterior and posterior whole-body images were also acquired at 3–4 h with the patient in the supine position (matrix 256 × 256). SPECT of the skull was acquired for all patients by use of a hybrid SPECT-CT dual-head gamma camera; it was obtained in a 360° circular orbit with 60 stops and 25 s/stop. Emission data were acquired by use of parallel-hole, low-energy, high-resolution collimators, with the patient in the supine position. The image acquisition matrix was 128 × 128, and the pixel size was 4.8 mm. Images were acquired on the 140-keV photopeak with a 20% symmetrical window. The SPECT was followed by CT examination with acquisition settings of 140 kV, and 2.5 mA tube current, 512 × 512 matrix. The raw data were reconstructed using the filtered back projection with a Butterworth filter in coronal, sagittal, and transaxial planes. Fusion of the SPECT and CT images was carried out and attenuation correction was applied to these images by use of CT-based attenuation maps. Scatter correction was also applied. The corrected SPECT images were reconstructed again. Subsequently, tomographic slices were generated and displayed for transaxial, coronal, and sagittal slices. SPECT emission images were fused with the transmission CT images. Planar triple phase bone scan (TBS), SPECT, and SPECT/CT images were reviewed by two experienced nuclear medicine physicians. To evaluate the planar TBS images, posterior views were used. Increase in blood flow in perfusion phase, blood pool, and delayed skull base radiotracer uptake in comparison to the nonaffected side were interpreted as positive for osteomyelitis. Furthermore, increased radiotracer uptake in the skull base region was interpreted as positive for osteomyelitis in SPECT images which analyzed in the transaxial, coronal, and sagittal planes. The presence of destructive bony lesions and periosteal reaction of skull base on CT were interpreted as positive for osteomyelitis. SPECT/CT images were analyzed for anatomical localization of abnormal increased tracer uptake and destructive bony lesions. Results of the TBS, SPECT, and SPECT/CT images were compared with the patient's clinical manifestations and with the diagnostic CT scans. On SPECT-CT images, detection of abnormal increased tracer uptake in the region of skull base with even minimal CT findings was considered as positive for SBO (because more than 30% of the affected bone must be demineralized to appear eroded on CT). In this study, the cases with positive or possibly positive result were taken positive for SBO, whereas, cases with negative, possibly negative and with equivocal result were taken negative for SBO. Final diagnosis (presence or absence of SBO) was obtained from clinical manifestations, laboratory investigations, imaging follow-up (CT and SPECT-CT), and histopathology and microbiology (when available). Improvement in patient's clinical manifestations with antibiotic treatment and/or reduction or disappearance of imaging findings suggestive of SBO was considered positive. Data were expressed as mean ± standard deviation and were expressed as number and percentage. Sensitivity and accuracy were calculated for planar BS, SPECT, CT, and SPECT/CT. To compare sensitivity of these diagnostic tests, we used the McNemar's test Chi-squared with Yates correction of 0.5. Comparison of numerical variables was performed using Student's t-test. All statistical calculations were performed using computer programs SPSS advanced statistics version 22, 2013. (Statistical Package for the Social Science; SPSS Inc., Chicago, IL, USA). P < 0.05 was considered statistically significant. This prospective study was conducted on 23 patients with otitis externa, clinically suspected of SBO, they were referred to Nuclear Medicine Unit (NEMROCK), Cairo University for bone scintigraphy between April 2016 and December 2017. All patients were diabetic (type II diabetes mellitus), and six patients were on insulin, 65.2% of them were male, however 34.8% were females, their mean age was (61.30 ± 5.56). All patients had unilateral ear disease. Patient's characteristics are shown in [Table 1]. Microbiological analysis was done for 17 patients (73.9.2%), and it was positive for P. aeruginosa in 13 patients (76.5) and positive for Staphylococcus aureus in four patients (23.5). Tissue biopsy from eight patients (34.8) was undergone histopathological examination, and it showed the presence of inflammatory cells in all of them. Final diagnosis (presence or absence of SBO) which were obtained from clinical manifestations, imaging follow-up (CT and SPECT-CT), and histopathology and microbiology (when available) revealed 22 patients positive for SBO and one patient was negative. Diagnostic CT scan was done for all patients and showed destructive bony lesions keeping with SBO in 13 (56.5) patients, all of them had SBO in final diagnosis, whereas, the results were possibly negative for SBO in six patients (26.1%), who were proved to have SBO in final diagnosis and possibly positive for SBO in three patients (13%), all of them had SBO in final diagnoses. CT result was negative in one patient, who was proved to be negative in final diagnosis as well. TBS was positive for SBO in 11 out of 23 patients (47.8%), as there was increased blood flow in the perfusion phase, increased soft-tissue tracer uptake in the blood pool phase, and delayed images at 2–3 h showed increased tracer uptake in the temporal region of the skull, all those patients were proved to have SBO in final diagnoses, while it was negative in three patients (13%), who were proved to have SBO in final diagnoses, and equivocal in nine patients (39.2), eight of them proved to have SBO in final diagnoses while one patient was negative for SBO. TBS was unable to correctly locate the site of skull lesions in most patients. SPECT images of the skull improved sensitivity for detection of SBO, as it was positive for SBO in 19 patients (82.6%), all those patients were proved to have SBO in final diagnoses, while it was negative in one patient (4.3%) who was proved to have SBO in final diagnoses, and equivocal in three patients (13.1%), two of them proved to have SBO in final diagnoses, while one patient was negative for SBO. Hybrid SPECT/CT imaging of the skull had the highest sensitivity for detection of SBO, as it was positive for SBO in 22 patients (95.7%) all of them had SBO in final diagnoses, while the result was possible for SBO in one patient, who was proved to be negative in final diagnoses. There were localized areas of increased tracer uptake in the mastoid portion of the temporal bone of the skull in 18 (73.9) patients and petrous portion in 4 (17.4) patients and sphenoid in one patient. The results of different imaging modalities (PBS, SPECT, CT, and SPECT/CT) and comparison of them with the final diagnosis are summarized in [Table 2]. The imaging modalities which had the most equivocal results were PBS (9/23) followed by SPECT (3/23). No equivocal results were detected with CT or SPECT-CT. SPECT-CT had the highest sensitivity (100%) and highest accuracy (95.7%) in diagnosis of SBO, whereas, PBS showed the lowest sensitivity (50%) and lowest accuracy (52.2%). Sensitivity and accuracy of different imaging modalities are showed in [Table 3]. The sensitivity of planar BS, CT, SPECT, and SPECT/CT were compared using the McNemar's test Chi-squared with Yates correction of 0.5. Statistical significance difference was detected between planar BS and SPECT (P = 0.057), planar BS and SPECT/CT (P = 0.001) and between CT and SPECT/CT (P = 0.031). No statistically significant difference was detected between SPECT and SPECT/CT (P = 0.250), CT and planar BS (P = 0.125), and between CT and SPECT (P = 0.508). In this study, SPECT-CT considered the best modality for accurate localization of site of SBO involvement, followed by CT. SPECT and planar BS were less accurate in this consideration. TPBS and SPECT/CT images of three patients with SBO are shown in [Figure 1]a, [Figure 1]b, [Figure 2]a, [Figure 2]b, [Figure 2]c, and [Figure 3]a, [Figure 3]b, [Figure 3]c to demonstrate different patterns of skull bony involvement in SBO. Malignant otitis externa complicated to SBO is an aggressive serious, rare infection of the temporal bone and base of the skull, associated with possible involvement of the facial nerve, carotid artery, jugular vein, and mastoid. It is associated with high mortality rate and poor response to treatment, so it was termed malignant. The most common causative organism is P. aeruginosa, but also Staphylococcus, Candida, and Aspergillus have been reported. Mortality and morbidity has improved with antibiotics. Mortality remains around 33% and increases to 80% with cranial nerve involvement. Adverse outcome was caused by SBO, intracranial extension, and multiple cranial nerve involvement. Bilateral or contralateral SBO is very rare and diabetics are more susceptible, comprising up to 94% of cases. In diabetes mellitus, poor vascular supply resulting from microvascular disease aggravates vasculitis. Diabetes mellitus is also associated with impaired polymorphonuclear cell function and a higher pH of cerumen in the aural canal. These factors, along with the sensitivity of P. aeruginosa to low pH, further decrease body defense against infection. In this study, all patients were diabetic, microbiological analysis was done for 17 out of 23 patients (73.9%), and it was positive for P. aeruginosa in eight patients (66.7%) and for S. aureus in four patients (23.5%). A CT scan is the investigation of choice for the initial evaluation of the extent and severity of extra-temporal soft-tissue involvement in SBO. However, since more than 30% of the affected bone needs to be demineralized to appear eroded on CT, early findings are limited to soft-tissue inflammation, while, advanced disease will show skull base bone destruction. CT cannot differentiate between SBO and malignancy. MRI is better than CT in identifying soft-tissue abnormalities, but it cannot detect bony destruction. The only significant findings exclusive to MRI are dural enhancement and involvement of the medullary bone; so, it is recommended when bony erosion of the skull base is seen on the CT scan. However, MRI is nonspecific and differential diagnoses of central SBO including neoplastic and nonneoplastic diseases (inflammatory pseudotumor, Wegener's granulomatosis, tuberculosis, sarcoid, fibrous dysplasia, and Paget's disease) must be ruled out. Addition of diffusion-weighted MRI imaging can be very useful for differentiating between osteomyelitis and malignancies involving skull base. Bone scintigraphy with 99mTc MDP has high sensitivity in diagnosis of patients with SBO. This is attributed to the fact that this radiotracer concentrates in areas with increased osteoblastic activity as found in infection, trauma, and neoplasm. 99mTc MDP bone scan allows earlier diagnosis of osteomyelitis than CT, as it can detect as little as 10% of the bone demineralization. Slow progression of periosteal reaction and bone formation in diabetic patients compared to nondiabetics renders radiographic changes less sensitive in diagnosis of those patients. Hence, combination of radiological and radionuclide imaging is needed for initial diagnosis and follow-up of the treatment response. Treatment of malignant otitis externa and SBO requires aggressive management including meticulous aural toilet, antibiotics for prolonged periods of time, approximately for 8–12 weeks. Moreover, strict glucose control in patients with diabetes. Surgical resection of affected bone is not recommended to prevent disease spread through fascial and vascular planes. In this study, the cases with positive or possibly positive result were taken positive for SBO, whereas, cases with negative, possibly negative, and with equivocal result were taken negative for SBO. In this study, TBS has 50% sensitivity, and 52.2% accuracy as it was positive for SBO in 11 out of 23 patients (47.8%), all those patients were proved to have SBO in final diagnoses, while it was negative in three patients (13%), who were proved to have SBO in final diagnoses, and equivocal in nine patients (39.2), eight of them proved to have SBO in final diagnoses while one patient was negative for SBO. TBS was unable to correctly locate the site of skull lesions in most patients. Diagnostic CT scan was done for all patients and it has 72.7% sensitivity, and 73.9% accuracy. It showed destructive bony lesions keeping with SBO in 13 (56.5) patients, all of them had SBO in final diagnosis, whereas, the results were possibly negative for SBO in six patients (26.1%), who were proved to have SBO in final diagnosis and possibly positive for SBO in three patients (13%), all of them had SBO in final diagnoses. CT result was negative in one patient, who was proved to be negative in final diagnosis as well. Diagnostic CT scan has no equivocal results, and when combining planar BS and CT, interpretation changed from false negative (equivocal, negative in planar bone scan) to true positive (positive and possibly positive in CT) in five patients. Thus, adding CT to planar BS improved diagnostic interpretation for 21.7% of patients (5/23). SPECT images of the skull improved sensitivity for detection of SBO (86.4%), as it was positive for SBO in 19 patients (82.6%). In this study, hybrid SPECT/CT imaging of the skull had the highest sensitivity for detection of SBO (100%), as it was positive for SBO in 22 patients (95.7%) all of them had SBO in final diagnoses, while the result was possible for SBO in one patient, who was proved to be negative in final diagnoses. Thus, when it was compared to SPECT, SPECT/CT changed the diagnostic interpretation in four patients out of 23 (17.4%) from negative and equivocal result to positive, among those four patients, three had SBO in final diagnoses. We found that the imaging modalities which had the most equivocal results were PBS (9/23) followed by SPECT (3/23). No equivocal results were detected with CT or SPECT-CT. SPECT-CT had the highest sensitivity (100%) and highest accuracy (95.7%) in diagnosis of SBO, whereas, PBS showed the lowest sensitivity (50%) and lowest accuracy (52.2%). When comparing sensitivity of planar BS, CT, SPECT, and SPECT/CT, statistical significant difference was detected between planar BS and SPECT (P = 0.057), planar BS and SPECT/CT (P = 0.001) and between CT and SPECT/CT (P = 0.031). However, No statistically significant difference was detected between SPECT and SPECT/CT (P = 0.250), CT and planar BS (P = 0.125), and between CT and SPECT (P = 0.508). Similar to my results, Chakraborty et al. have reported the important role of SPECT/CT in early evaluation of the extent of skull base involvement in case of SBO. Furthermore, Chen and Hsieh recommended to use routinely SPECT/CT when assessing patients with suspected SBO even without evidence of lesion on planar images. In another study by Sharma et al., 99mTc-MDP SPECT/CT locate the site of involvement in all patients and enabled highly accurate diagnosis of SBO. Conventional 99mTc MDP planar images are often unable to locate the exact site of the infection, despite being a sensitive technique for diagnosis of osteomyelitis, it has limited spatial resolution and cannot detect accurately the site of involvement in the case of SBO. It was especially difficult to locate the site of bony involvement in cases with centrally located lesions. In this study, SPECT-CT considered the best modality for accurate localization of site of SBO involvement, followed by CT. SPECT and planar BS were less accurate in this consideration. Hybrid SPECT/CT accurately detect localized areas of increased tracer uptake in the mastoid portion of the temporal bone of the skull in 18/23 (73.9) patients and petrous portion in 4 (17.4) patients and sphenoid in one patient. This results were similar to results of Horger et al., as they have shown that a much higher percentage of lesions can be characterized by use of SPECT-CT compared with SPECT alone. Hybrid SPECT/CT result was possible for SBO in one patient, who proved to be negative in final diagnoses, this may be explained by nonspecific uptake of 99mTc MDP in cases of mastoiditis. This study has some limitations. First, the small number of patient population reduced statistical power of the study. Due to the rarity of this disease, it is difficult to record a larger patient population at a single center. Second, MRI findings were not available. To overcome these limitations, a large multicenter study comparing SPECT/CT and MRI must be done. Third, microbiological analyses were not done for all patients, it was done for only 52.2% of patients. 99mTc-MDP SPECT/CT has high sensitivity in the diagnosis of SBO and also provide accurate localization of the site of SBO. Statistical significant difference was detected between planar BS and SPECT (P = 0.057), planar BS and SPECT/CT (P = 0.001), and between CT and SPECT/CT (P = 0.031). Chandler JR. Malignant external otitis. Laryngoscope 1968;78:1257-94. Bernheim J, Sade J. Histopathology of the soft parts in 50 patients with malignant external otitis. J Laryngol Otol 1989;103:366-8. Sreepada GS, Kwartler JA. Skull base osteomyelitis secondary to malignant otitis externa. Curr Opin Otolaryngol Head Neck Surg 2003;11:316-23. Martel J, Duclos JY, Darrouzet V, Guyot M, Bébéar JP. Malignant or necrotizing otitis externa: Experience in 22 cases. Ann Otolaryngol Chir Cervicofac 2000;117:291. Ceruse P, Colleaux B, Truy E, Disant F, Morgon AH, Lahneche B, et al. Malignant external otitis. Apropos of 7 recent cases. Ann Otolaryngol Chir Cervicofac 1993;110:332-6. Devaney KO, Boschman CR, Willard SC, Ferlito A, Rinaldo A. Tumours of the external ear and temporal bone. Lancet Oncol 2005;6:411-20. Gold S, Som PM, Lucente FE, Lawson W, Mendelson M, Parisier SC, et al. Radiographic findings in progressive necrotizing “malignant” external otitis. Laryngoscope 1984;94:363-6. Hardoff R, Gips S, Uri N, Front A, Tamir A. Semiquantitative skull planar and SPECT bone scintigraphy in diabetic patients: Differentiation of necrotizing (malignant) external otitis from severe external otitis. J Nucl Med 1994;35:411-5. Chakraborty D, Bhattacharya A, Kamaleshwaran KK, Agrawal K, Gupta AK, Mittal BR, et al. Single photon emission computed tomography/computed tomography of the skull in malignant otitis externa. Am J Otolaryngol 2012;33:128-9. Narozny W, Kuczkowski J, Stankiewicz C, Kot J, Mikaszewski B, Przewozny T, et al. Value of hyperbaric oxygen in bacterial and fungal malignant external otitis treatment. Eur Arch Otorhinolaryngol 2006;263:680-4. Duvvi S, Lo S, Kumar R, Blanshard J. Malignant external otitis with multiple cranial nerve palsies: The use of hyperbaric oxygen. Internet J Otorhinolaryngol 2005;4:1-5. Ganadhar S, Sreepada S, Kwartler J. Skull base osteomyelitis secondary to malignant otitis externa. Curr Opin Otolaryngol Head Neck Surg 2003;11:316-32. Rutka J. Acute otitis externa: Treatment perspectives. Ear Nose Throat J 2004;83:20-1. Cohen D, Friedman P. The diagnostic criteria of malignant external otitis. J Laryngol Otol 1987;101:216-21. Handzel O, Halperin D. Necrotizing (malignant) external otitis. Am Fam Physician 2003;68:309-12. Murray ME, Britton J. Osteomyelitis of the skull base: The role of high resolution CT in diagnosis. Clin Radiol 1994;49:408-11. Grandis JR, Curtin HD, Yu VL. Necrotizing (malignant) external otitis: Prospective comparison of CT and MR imaging in diagnosis and follow-up. Radiology 1995;196:499-504. Chang PC, Fischbein NJ, Holliday RA. Central skull base osteomyelitis in patients without otitis externa: Imaging findings. AJNR Am J Neuroradiol 2003;24:1310-6. Ozgen B, Oguz KK, Cila A. Diffusion MR imaging features of skull base osteomyelitis compared with skull base malignancy. AJNR Am J Neuroradiol 2011;32:179-84. Franco-Vidal V, Blanchet H, Bebear C, Dutronc H, Darrouzet V. Necrotizing external otitis: A report of 46 cases. Otol Neurotol 2007;28:771-3. Strashun AM, Nejatheim M, Goldsmith SJ. Malignant external otitis: Early scintigraphic detection. Radiology 1984;150:541-5. Seldin DW, Heiken JP, Feldman F, Alderson PO. Effect of soft-tissue pathology on detection of pedal osteomyelitis in diabetics. J Nucl Med 1985;26:988-93. Okpala NC, Siraj QH, Nilssen E, Pringle M. Radiological and radionuclide investigation of malignant otitis externa. J Laryngol Otol 2005;119:71-5. Blyth CC, Gomes L, Sorrell TC, da Cruz M, Sud A, Chen SC, et al. Skull-base osteomyelitis: Fungal vs. bacterial infection. Clin Microbiol Infect 2011;17:306-11. Chen YH, Hsieh HJ. Single photon emission computed tomography/computed tomography for malignant otitis externa: Lesion not shown on planar image. Am J Otolaryngol 2013;34:169-71. Sharma P, Agarwal KK, Kumar S, Singh H, Bal C, Malhotra A, et al. Utility of (99m)Tc-MDP hybrid SPECT-CT for diagnosis of skull base osteomyelitis: Comparison with planar bone scintigraphy, SPECT, and CT. Jpn J Radiol 2013;31:81-8. Horger M, Eschmann SM, Pfannenberg C, Storek D, Vonthein R, Claussen CD, et al. Added value of SPECT/CT in patients suspected of having bone infection: Preliminary results. Arch Orthop Trauma Surg 2007;127:211-21.